March « 2013 « Krysztov In China! So as some of you might have heard, the department I was substitute teaching English for finally got their regular contracted teacher in, and so I was out of work. Rachelle had been going to Pilates classes and had been talking to the instructor about various things, and she mentioned she was thinking about bringing in a new instructor. Over the last month or so I’ve been learning Pilates and getting myself back into shape, and today was the first day of the first weekend of instructor training. And since the owner of the studio, who was leading the training, feels it’s official enough to tell everyone else at the session, it’s official enough to spread on a blog: I will be teaching Pilates at Ying’s Authentic Pilates studio in Guangzhou. Following the instructor training, and a certification exam, of course, and then there’s a period of apprenticeship and then I can lead classes at the studio and hell, run my own show if the fancy strikes me. I’ve decided to write more about the various food items one might encounter in China. So, when the fancy strikes me, I shall cast my spotlight upon whatever I find worthy of such attention. 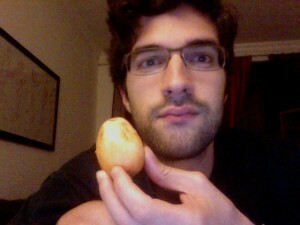 This evening, I am inspired by the loquat. In Chinese, that would be 枇杷 (pi2 pa). They seem to be in season around this time of year, so you will see street vendors and market stalls stocked with twigs bearing a multitude of these smallish, oblong orange fruit. The texture reminds me somewhat of a very ripe nectarine or apricot, maybe, and the ones I am eating are very mild and sweet, with just a touch of acidity. Inside you will find a cluster of large seeds (I think 4-6 of them), which are very bitter and contain a bit of hydrogen cyanide. This is important to remember because some people use the seeds for various purposes, and consuming too much of that will kill you. But hey, what’s life without a few risks? Anyway, there were some loquats in the fridge, and now there aren’t so many. They’re said by some to have a mild sedative effect when eaten in quantity, so we’ll see if I sleep any better tonight. I remembered to take a picture of one of the last ones as an afterthought. They’re just so tasty! The rainy season has come. Last night and this afternoon we had pretty much torrential rainfall with our thunderstorms, with some drizzle in between, and a couple conveniently placed clear moments which coincided with my run out to get Rachelle’s bus ticket, and my travel to and from Pilates class this evening. With the rain, of course, comes the humidity. It was pretty brutal when we got here in September, but I’m not sure I can ever really get used to it. The air might not be all that hot, but if you so much as walk briskly, you won’t be able to cool down until you find an air conditioner. Our three dehumidifiers and our air conditioner are going to be running damn near full-time. Rachelle is in Zhuhai until tomorrow evening–she didn’t want to take any more two-hour plus bus rides than she absolutely needed in this weather, so that leaves Rigel and me free to do what we please. Which isn’t much, given our budget constraints. On the plus side, Rigel’s hormones seem to be winding down. He isn’t stinking up the house with body odor or pooping everywhere as much as he was for a while, and he seems to have mostly gotten over his temporary dislike of me. Now we chill together like bros. Knock on wood. Shortly after we arrived in Guangzhou, we met a doctor friend of Rachelle’s friend we replaced. 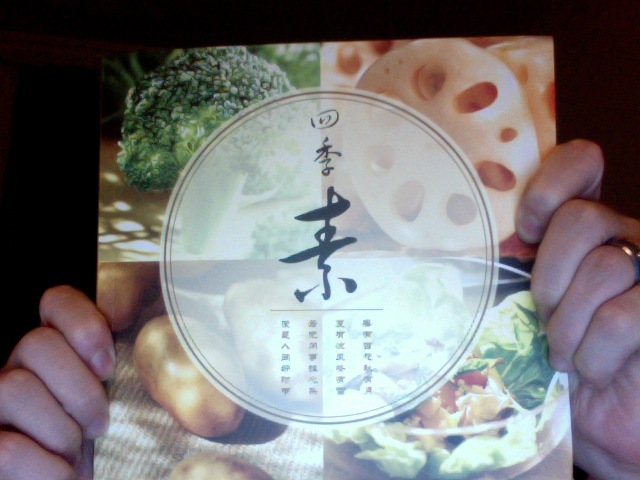 He introduced us to the wonders of vegetarian Buddhist Chinese food at a restaurant called Yixin, near the rail station. It was a refreshing change from our previous experiences with Chinese and especially Cantonese cuisine up to that point, which usually involved our food staring back at us, or playing a rousing game of “Guess Which Organ This Is.” In addition to various veggies and bean curd, as would be expected, there were also quite a few textured vegetable protein fake-meat dishes, most of which were surprisingly convincing, and all of them super-delicious. Fast forward. One of Rachelle’s colleagues’ friends owns another Buddhist vegetarian restaurant, right next to Rachelle’s gym and the campus. 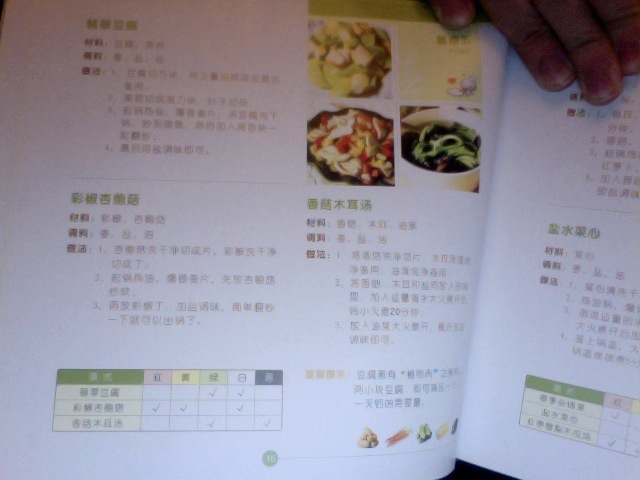 And, we got a cookbook, each with two weeks’ worth of recipes for each season. It’s in Chinese. I think I can figure it out. Or terrible, I’m not sure yet. Rachelle assures me it will be great. She’s the best. Sample page! It appears to indicate which colors you get from which dishes. Rigel and I have both been exiled from the kitchen while Rachelle is cooking. 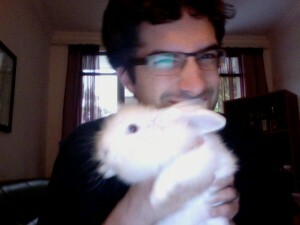 In other news, rabbits reeally hate posing for pictures. Things in China seem to happen at a different rate than they do elsewhere. People, for example, tend to be slower. I’m not just talking about the people in front of you on the sidewalk who can’t seem to manage any speed faster than “arthritic statue” while walking seven abreast, although that certainly jumps out at you (though slowly, of course). Punctuality does not seem to be a virtue. Any time you plan on meeting someone here, they will show up no less than fifteen minutes after you. Even if you’re also late. I have since come to never expect anyone to arrive on time. Other things, however, seem to progress much more quickly. For example, most of Guangzhou’s central business district, now towering high-rises on top of shopping malls for as far as the eye can see, was not twenty years ago an expanse of remote farming villages. To this day, one can still see cranes dominating the skyline, as though somebody decided the skyscrapers weren’t nearly dense enough. In a city of 40 million and growing, as more migrant workers arrive daily from the countryside, they might be right. The other day, my wife wanted to go to a small grocery store on campus to buy some new notebooks. We had not been by there since before the Spring Festival holiday. The store was no longer there, and there seemed to be no explanation for its removal. Likewise, tonight I planned to take her to dinner at our favorite Sichuan hole-in-the-wall. Again, it had been a little over a month since we had been to that area. We walked along the little road outside the Little North Gate, until we were certain we had walked too far. We turned back. Rachelle was frustrated that I had led us right past it. When we reached the place I was sure it had been last time, I stopped, and realized our favorite place for spicy deliciousness was no more. The sign had been changed, but more surprisingly, the entire layout of the building had been remodeled. The food was still plenty spicy, but they didn’t have our favorite dishes, and everything seemed more expensive. It seems everything’s getting more expensive. The Irish pub and restaurant we frequent recently did away with their daily specials and replaced their whole menu with a selection that was almost identical, but much more expensive. We can’t go there as much nowadays. In the same part of town, the lady Rachelle bought oranges from every week stopped showing up, and none of the other vendors are a suitable replacement. Nothing seems to stay the same around here for very long. This isn’t all bad, though. My time as a last-minute replacement English instructor ended last semester, and now I’m training for a new career as a replacement Pilates instructor. Only a few things stay the same around this city: The heat and humidity are back, the meat-on a stick vendors still sell their yummy wares, no matter how many times the cops make a show of driving them off, there are still random couches on street corners and people napping on them at all hours, and the haze of pollution never leaves the air for long. Ah, Guangzhou! Durian — That lovely stinky fruit, and other tales.